Are you a fan of YA novels? Young adult literature is booming right now, from contemporary sob-fests like The Fault in Our Stars to action adventure series like The Maze Runner. And with Shakespeare a staple of the high school classroom, it makes sense authors would want to tackle Shakespeare retellings for their teen audience. 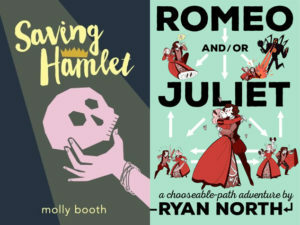 Two of the authors featured on our list below, Molly Booth and Ryan North, are also guests on our Shakespeare Unlimited podcast. If the title didn’t make it immediately apparent, this novel is a take on The Winter’s Tale. High school cheerleader Hermione has to face her senior year after being sexually assaulted at cheerleading camp. Even as her friends and family rally around her, she’s forced to confront how she’s changed, and what she wants her altered future to look like. In this time traveling comedy, high school sophomore Emma is stretched between multiple worlds — the world of Hamlet, her school play, her real life at school, and 17th century England, where she somehow ends up working with Shakespeare himself. This story has mistaken identifies, rapidly changing affections, and two stagings of Hamlet hanging in the balance. Just like the original story of doomed young lovers, Romiette and Julio come from different worlds. But they fall in love hard and fast, believing nothing can truly stand in the way of their love. Gasps and swoons are to be expected from any reader. The school drama club putting on As You Like It serves as a back drop for some real-life costumes, new identities, and relationships wrapped up in real feelings but false personas. Examining what happens when friends (and sisters) keep secrets and try to expose them through games instead of talking it out, this novel is sweet and funny. Fair warning: you will cry reading this YA title with ties to King Lear. Cadence can’t figure out the big blank in her memory or her constant migraine headaches, but she hopes a summer with her extended family, including her beloved cousins and their friend she has an enormous crush on, will help her solve it. But, as the summer unfolds, she begins to have doubts anything in her life could have an easy fix. This modern day take on Hamlet, set in a world where the prince of Denmark, and everyone around him, is total tabloid fodder. Told from the perspective of Ophelia, it quickly becomes apparent that, however troubled Hamlet’s family life is, she’s the one with the most problems. In this novel, every bit as dark as its source material, Michelle Ray re imagines the story of Macbeth’s dangerous ambition in the only world as cutthroat as royal politics — Hollywood. Another take on Hamlet from his tragic lover’s perspective, Ophelia suggests there was even more drama happening behind the scenes as the Danish prince ranted and raved. Giving the women of the play more action and more dimensions, this book will leave you seeing the original play in a whole new light. You’d think it would be hard to pack Macbeth with even more murderous plots, but Klein’s story of a young woman who chooses to defy her family ties for true love attempts just that. With plenty of tropes Shakespeare himself loved to employ (the secret child raised by another, family loyalty clashing with romantic love), Lady Macbeth’s Daughter is a story the Bard would definitely appreciate. Cooney takes Macbeth and adds a teen protagonist on the edges who must deal with the actions of the royal Macbeths — and decide how much power she has to change what has been fated to happen. Ryan North, who you may know as the web-cartoonist behind Dinosaur Comics, unleashes a choose-your-own-adventure version of Hamlet, in which you can play as the Danish prince, his father, or Ophelia. This book broke the record for the most-funded publishing project on Kickstarter ever. Following up on the success of To Be or Not to Be, this choose-your-own-path spin on Romeo and Juliet offers you more than 100 possible endings for the star-crossed lovers. Play as the title characters—or even Juliet’s nurse! Do you have any favorite YA novels that put a twist on Shakespeare? Tell us in the comments. Interesting list! Thanks for compiling and posting this.